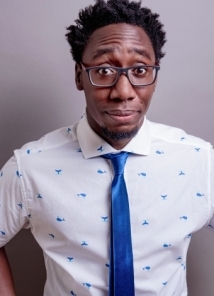 Sydney Adeniyi is a Nigerian-American comedian from Belleville IL, a small city near St. Louis MO. At an early age, Sydney found a knack for making people laugh by improvising jokes for friends and family. He took his talent to stage a few years after graduating college. Now, he startles audience's funny bone with satirical and curious material with a touch of mischief. Sydney's likable, relaxed and engaging comedy breaks the mold while being uniquely original and fun. Sydney appeared on the TV show Laugh Out Loud St. Louis, the movie Sad Café, and ABC’sWindy City Live. He was featured at Laugh Your Asheville off comedy festival and won “The Best of The Best” Chicago comedy contest. You can catch Sydney touring his Comedy Special, on Internet Radio, and on TV & Commercials.